Starting in mid-January 2017, a Seattle City Light contractor will be working in the Capitol Hill neighborhood to install underground electrical conduit, vaults and associated equipment in parts of East Union Street from 10th to 11th Avenue. This work is aligned with the City of Seattle’s ordinance to underground power lines in this area. Contracted crews will begin the first stage of work on East Union Street at the intersections of 10th and 11th avenues. Crews will be potholing and trenching in these areas. Map of the stage 1 construction work area from January to February 2017. There will be parking restrictions within the construction work area as trucks and equipment will be staged on site. Traffic control flaggers will be used to maintain access along the construction work area. Excavated areas will be covered over with steel plates during non-work hours. Access to businesses will be open at all times. Daily work hours are from Monday to Friday, 7:30 a.m. to 4:30 p.m. This stage of work is anticipated for completion in February 2017. Once completed, crews will transition to other stages of work within the project zone. The entire project is expected to last approximately five months. Overall project zone depicted. Work impacts will be phased and active work areas will be updated within this footprint. Staging information will be updated regularly on the East Union Street Underground Conversion website. For more information, customers can contact Susan Kallies, Seattle City Light Resident Engineer at (206) 684-7265 or susan.kallies@seattle.gov. Visit Seattle City Light’s construction website for the latest updates on this project: http://www.seattle.gov/light/atwork/release.asp?RN=377. Seattle City Light is working to increase the reliability of the electrical system in the Capitol Hill neighborhood by installing new conduit (duct bank) and electrical vaults along Summit Avenue East and East John Street, adjacent to Summit Slope Park. The work will be completed in three stages, beginning with Stage 1. Orange highlights indicate the construction work areas. Stage 1 (Early to late September): A vault shoring box will be assembled on Summit Avenue East. Two days are required for the assembly and disassembly of the box. 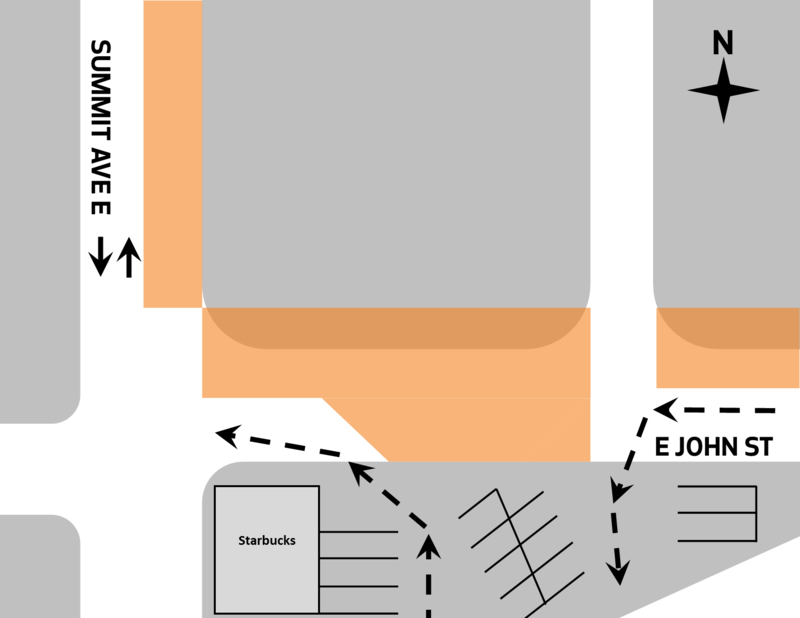 A portion of East John Street (between the driveways on the east and west side of the Starbucks parking lot) will be closed to traffic due to the vault installation. Vehicles will have access to the parking lot on the south side of East John Street. 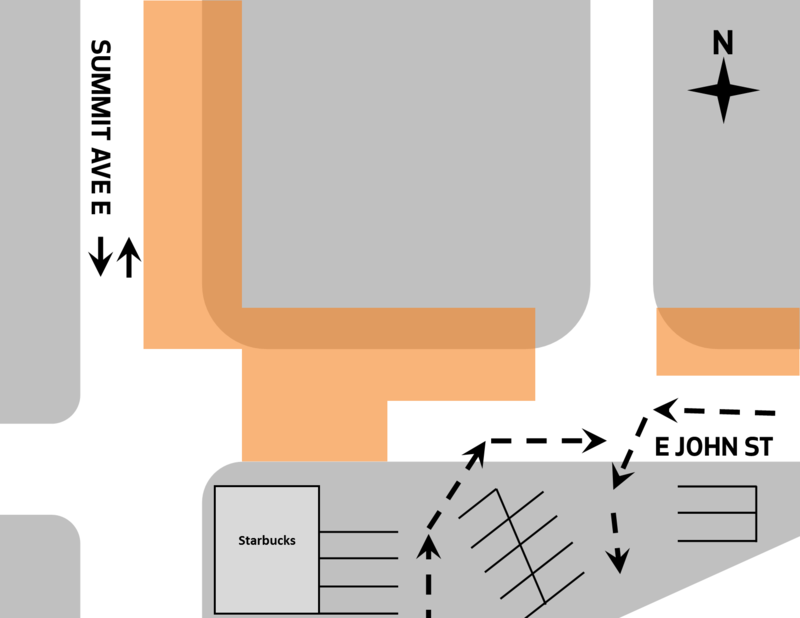 Vehicles exiting the lot onto East John Street will be required to turn left. Stage 2 (Late September to October): The alley next to Summit Slope Park will be closed during work hours. 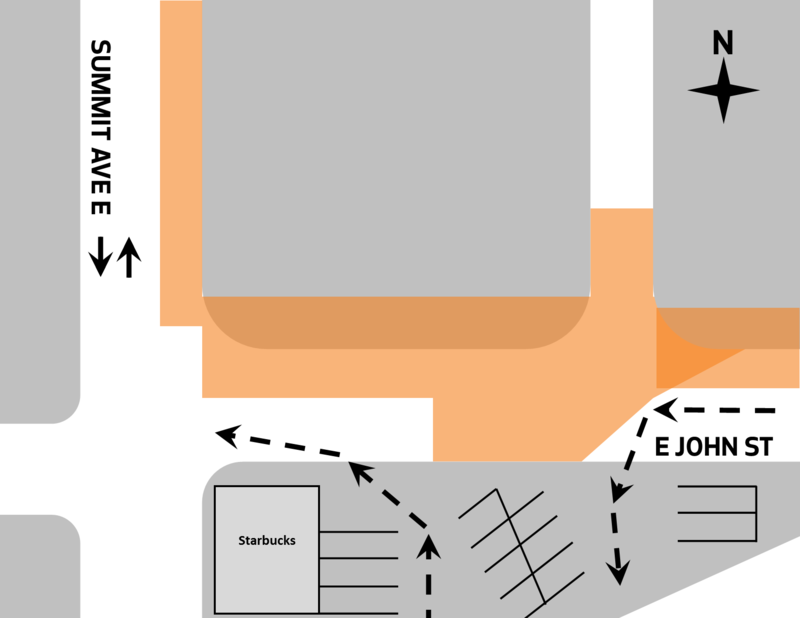 Stage 3 (From October to November): A portion of East John Street (on the west side of the Starbucks parking lot) will be closed to traffic due to the duct bank installation. Customers can expect sidewalk and traffic restrictions around Summit Slope Park. Traffic and pedestrian safety will be maintained by uniformed police officers. Travel lanes on Summit Avenue East will be maintained in both directions. Daily work hours are from Mondays through Fridays, 9 a.m. to 3 p.m, and Saturdays from 8 a.m. to 4 p.m.
For more information about this project, please contact Patty Breidenbach, Senior Electrical Service Representative at (206) 684-4795 or patty.breidenbach@seattle.gov. Visit Seattle City Light’s construction website for the latest updates on this project: http://www.seattle.gov/light/atwork/release.asp?RN=369.